Welcome to our home in Owen County, Kentucky!! Not only will I be showing beautiful pictures of this county, but also including history and local news!! 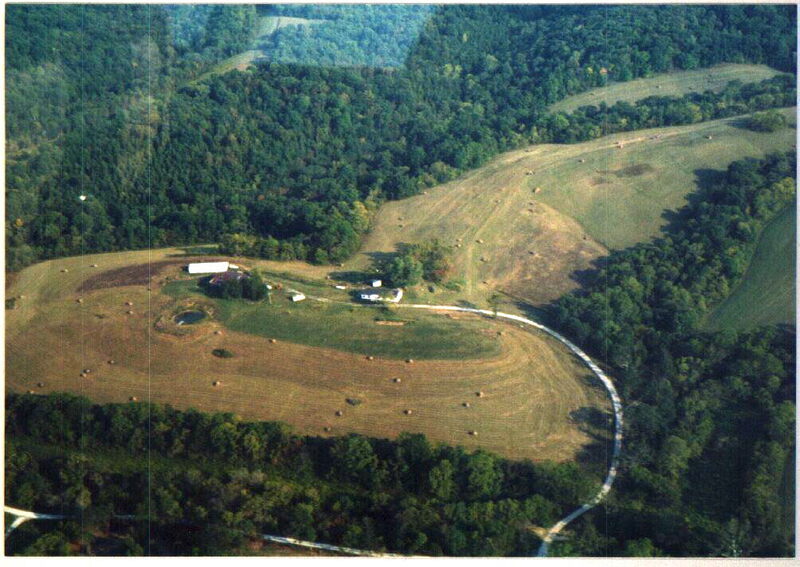 First I'd like to show all of you a photo of our 118 acres of land taken from a Cessna. It was my VERY FIRST plane ride, by the way! I hope you've enjoyed viewing it!! As you can see, we have a VERY long driveway!! In fact (although it can't be seen in the photo very well) there is a creek to cross before going up the drive!! In the summer, it's nothing but a trickle...but in the Autumn and Spring...well....WATCH OUT!! It can get as high as 20 feet!! If it's only three or four feet deep, we wear waders to cross. If it's higher...well....we do have a back way to walk in...across a neighbor's land.....over hills and two more smaller, but navigable creeks!! The forestland was unfortunately cut over by people back in the 1800's and a great many of the larger trees were taken for lumber. However, the forests are now starting to flourish as people become more aware of conservation. Owen County has a great many oak trees, hickory trees, and elms. Both the red and sugar maples are also making a big comeback. At one time there was a "sugarbush" in the upper woods where maple trees were tapped and the syrup cooked in an outside shed in large vats. Sad to say, the maples were cut down years ago and are just now beginning to make a comeback. When you read onward in my chapter entitled "Pennsylvania Days", you'll read about the days when my husband's family and later my husband and I made all our own maple syrup!! Now, a little about Owen County's history. I know....I know....HISTORY....boring, right?? All you want are pictures!! But a little history never killed anyone!! In fact, you may even find it interesting!! Did you know that until 1792 Kentucky was a part of Virginia? Representatives from Kentucky DID sit in the Legislature of Virginia, but they had a rough trip!! They traveled by horses and mules over the Cumberland Gap. WOW...what a journey that must have been! In 1792, Kentucky was admitted to the Union, but it had only nine counties...Jefferson, Fayette, Lincoln, Nelson, Bourbon, Mercer, Madison, Mason, and Woodford. In those days, Kentucky wasn't regarded as a dwelling place, but a hunting ground for the Indians. (That must explain all the arrowheads I found when plowing my first garden back in 1991!) In the language of the native Indians, Kentucky meant "Land of Blood." 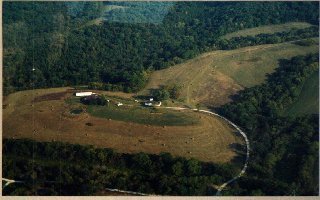 Before 1782, Kentucky's inhabitants didn't exceed 3,000. By 1800, after roads for carriages and wagons began to be opened up, the population amounted to about 220,000! Most of the new pioneer villages of that time were built near springs. Mills were a VERY necessary part of pioneer life and hence people sought water. These are just a few of the early mills...Herndon's, between Caney Fork aand Richmond; Spark's Horse Mill on the Kentucky River, Campbell's on Cobb's Station Road at the county line, Payne's on Eagle Creek, Branham's, on Cedar Creek near Monterey, Greenup Fork at Severn, Lusby's Mill and several others.Owen County was not formed until 1819. It consisted of a part of Franklin, Scott, Gallatin, and Pendleton counties. The citizens who lived along the boundaries of these counties petitioned the General Assembly to erect a new county as the roads were very bad and the distances which justices had to travel to court were enormous as the only mode of travel was by mule or horse. The county was named after Colonel Abraham Owen, who was born in Prince Edward County, Virginia in 1760 and then emigrated to Shelby County in Kentucky. He was a soldier in Captain Lemon's Company at St. Clair's defeat. In 1796, he was a surveryor of Shelby County, and afterwards magistrate. His father established Owen's Station in Kentucky during the frontier days, and Abraham Owen had become an Indian fighter. Abraham Owen commanded the first regiment raised in the Owen County area. He was soon promoted to Major and then to Colonel of the Regiment. After becoming Colonel, he was elected to the state legislature. In 1799, he was chosen a member of the Convention which framed Kentucky's Second Constitution. He later fought at the battle of Tippecanoe and lost his life on November 7, 1811. According to legend he was hit because he was riding a horse similar to the horse of the commander, William Henry Harrison. And so...Owen County was named after the fearless Abraham Owen. 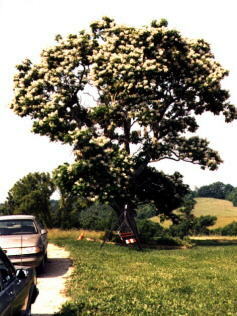 Thought you might enjoy a break from Owen County history to see a photo of the Catalpa Tree in our front yard. It's estimated to be about 100 years old....just a wee bit older than "yours truly"!! They're beautiful trees in the Spring...with the white blossoms, but can become very infested with the Catalpa Sphinx, the larvae of a moth that feeds SOLELY on Catalpa!! Two years ago, the worms stripped the tree COMPLETELY bare of leaves...then went on toward the house...climbing up the sides, over the roof, getting under doors, etc. YUK!! They climbed an old silver maple in the backyard.....climbed upwards...by the thousands...and then descended. (Guess they thought there might be Catalpa leaves up there! )During the next few years, we had very few worms...due to the increase of a parasitic moth that feeds upon the larvae. 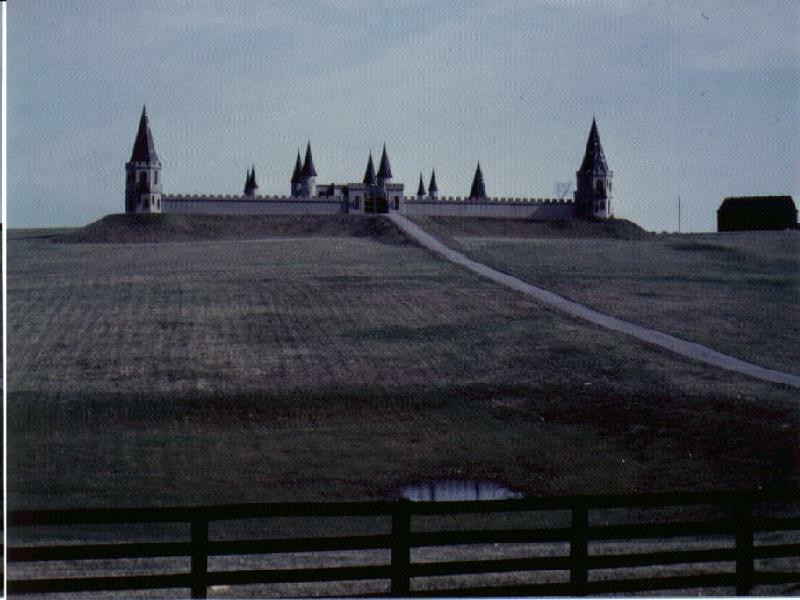 The above is an actual home built by a wealthy Kentucky man. "The Castle" as it is commonly known, reminds visitors of the medieval era. 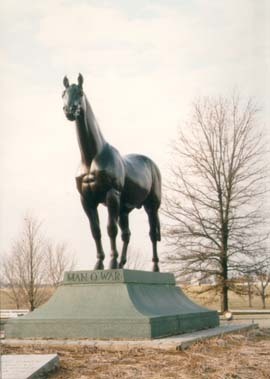 Above is the statue of Man O' War, one of the greatest race horses of all time. This photo was taken in the Kentucky Horse Park, a park that all visitors to Kentucky must surely visit!! 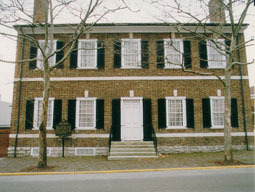 A photo of the historic Mary Todd Lincoln home. I'll be adding more pictures of Kentucky each week, so please bookmark this page and stop back often to visit!! If you have any ideas or suggestions for this page, please just click the CAT!! Oh...would you please take the cat back here? Thank you!